I'll be reading & signing on Saturday — with zombies! Come visit me at Paperbacks Plus, a wonderful independent bookstore in the Riverdale section of the Bronx, this Saturday, March 29th at 2:30 PM. I'll be reading from MY LIFE: THE MUSICAL. Books will be available for purchase and signing. Plus, enjoy a special guest appearance by the fabulous Riverdale Rising Stars! This amazing teen theater company will perform a few numbers from their production of "Zombie Prom," a hilarious musical that's playing now through April 12. For more info about "Zombie Prom," click here. Paperbacks Plus is located at 3718 Riverdale Avenue, between 238th and 235th Streets. For directions, click here. To best friends and devoted theater fans Emily and Philip, Aurora is no ordinary Broadway musical. Their love for the hit show (whose reclusive author has never been named) is nothing short of an obsession. Thanks to a secret loan from Emily's Grandma Rose, seeing the Saturday matinee has become a weekly ritual that makes real life seem dull and drab by comparison. But when the theatre chat rooms start buzzing with crazy rumors that Aurora may close, Emily and Philip find themselves grappling with some truly showstopping questions: Why does Emily's English teacher, Mr. Henderson, have such a strong aversion to Aurora? What, exactly, is the "one sure thing" in show business? How will they pay back the money they owe Grandma Rose? And why hasn't Philip asked Emily out on a real date? As they go to hilarious lengths to indulge their passion for Aurora, Emily and Philip must face the fact that all shows close sooner or later. But first they'll put their friendship to the ultimate test, solve Broadway's biggest mystery — and spend one unforgettable night at the theater. 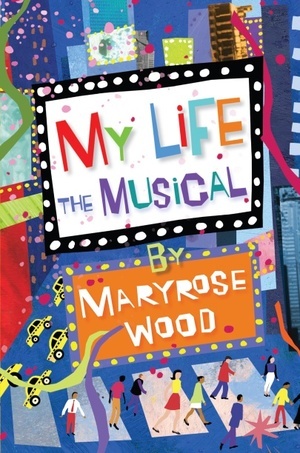 In My Life: The Musical, Maryrose Wood delivers a rollicking, warmhearted novel about Broadway, friendship, and the universal experience of being a fan.